Another light comedy from the end of Alice Guy’s Gaumont period, this is a step backwards on technical and creative levels from what she put out in 1906. It still manages to be funny, however, and to lightly comment on social mores and gender relations. We see a typical stage-style set of a kitchen, with obviously fake walls and appliances. A large cabinet takes up much of the right side of the set. A maid is setting out some food on the table, when the bell rings, indicating that someone is at the servants’ entrance. She reacts with excitement and runs to answer. She then re-enters along with a man dressed in a soldier’s uniform with a tall fur hat with a fur plume on top. This is her guest, who she entertains and gives free food to. Then the bell rings again, and she realizes someone else will catch her with the soldier. She hurriedly hides him in the cabinet, but his hat is too tall, and it knocks off the board which tops the cabinet and the plume sticks out, looking sort of like a furry animal’s tail. A new woman enters (I think she may be the cook, or possibly she is meant to be the mistress of the house), and she scolds the maid for being lazy and not getting work done. She sends the maid out of the kitchen and starts to work on preparing a meal. All the while, the plume of the hat is moving about in very silly ways, making sure that the audience doesn’t lose track of it, although no one onscreen notices it. Finally, the woman looks up and sees it, and she tries to climb a chair to look over the top of the cabinet, but it isn’t tall enough. So, she moves the table, places the table on top of the chair, and peers over the top, but she loses her balance and falls in. The plume continues to move about, now in a somewhat suggestive manner, accompanied, briefly, by the ladle the woman was carrying. Next, the butler comes in, leading a young lady friend, and they start to dine together, but the maid comes in and “catches” them at the same illicit activity she was previously engaged in. Now, the cabinet begins to hop about and “walk” across the floor, making everyone panic. The butler gets the key from the maid and opens it up, and the two inhabitants tumble out (the soldier snapping into a salute as he does). 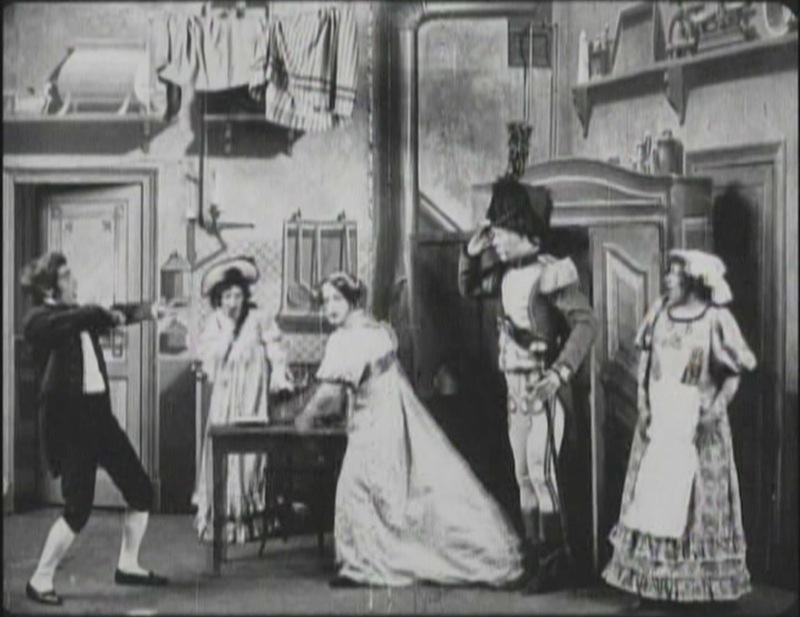 The woman from the cabinet now sees the butler with the girl and starts hitting and kicking him, and the maid has a similar reaction to finding her soldier in a cabinet with another woman. There’s a very similar sequence involving getting free meals from the servants and having to hide in a kitchen in Charlie Chaplin’s “The Count,” which makes me think that either Chaplin had seen this movie, or a close imitation, or that this concept was widespread in Vaudeville, where both Guy and Chaplin could have encountered it separately (I feel like I’ve seen another variation on it as well, but can’t recall the specific movie right now). This version, unfortunately, lacks Chaplin’s timing and originality. It also reminds me, in some ways, of “The Drunken Mattress” but doesn’t run with the concept the way that movie does. Instead, what we see is basically an older style of movie: all of it in one shot and location, with an unmoving camera stationed at a distance from the actors, framing a “stage” on which they perform, make entrances and exits, etc. It’s surprising to see Guy move backwards in this fashion, and what I have to assume is that Gaumont decided she was spending too much money and told her to go back to making one-shot films. This could be part of why she left. As I suggested, however, this movie still has some interesting aspects. The “help” here are shown as taking advantage of their position to “steal” food and wine from their masters and conduct their affairs in the kitchen. The authority figure (whether she’s a higher-placed servant or a mistress) interrupts and intervenes, but cannot actually prevent the shenanigans, and even appears implicated in them herself. The men are punished for their indiscretions, while the women are the agents of punishment, even though they also are guilty. The audience is encouraged to fantasize about what may happen within the cabinet, but nothing explicitly “vulgar” is shown, so it depends on the type of imagination possessed by the viewer. As in “The Drunken Mattress,” there is an implication that the cabinet, and indeed also the plume, takes on a life of its own once the person is out of sight, which has a somewhat surreal effect. It’s still interesting what Guy could do under these limitations, but it’s not one of the real standouts of her career.